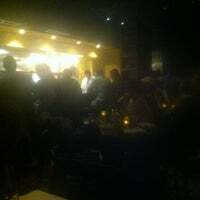 Another Batali success - this tapas joint is up there as one of our favorites. 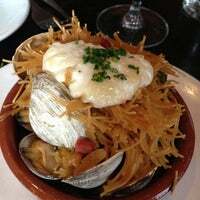 We love just about everything here, but the razor clams and the pumpkin and goat cheese croquetas are must-orders! 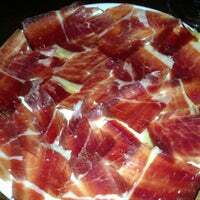 Fantastic tapas and authentic experience if you stand at the counter at Bar Jamon. Order the standards: pan con tomate, mussels escabeche, rillettes, Jamón iberico, polpo and finish with churros. Yummy!! The razor clams, duck egg with black truffle, setas (oyster mushrooms) with garlic! Tiny place with half tables and half bar style seats. Lovely wines as well. Try the Patatas bravas. Superb and delicious. Don't listen to them when they tell u that u can just walk in w/o reservation. when we arrived, we couldn't be seated since we didn't have a reservation! Casa Mono serves the food of Catalunya, with an emphasis on traditional dishes like fideos and croquetas. Expect a packed crowd at Bar Jamon, where the charcuterie and wine are the thing. COME HUNGRY & GET EVERYTHING. Pictured here: briny uni, silky eggs, fruity olive oil, tangy lime zest, and earthy nuts. Apparently I never knew balance before eating this. Dessert: olive oil cake! Unfortunately razor clam is not available all the time. But there are plenty other or all other dishes to make up for. Bone marrow. Creamy eggs. Fluke. Must sit at the counter table. You can't make a bad choice on this menu. 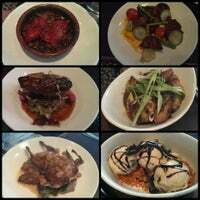 The blackened beats, soft shell crab, and pork belly were highlights. Be sure to ask for the sommelier for help with the extensive wine menu - he's great. Order the pata negra and the sherry wine fleet. 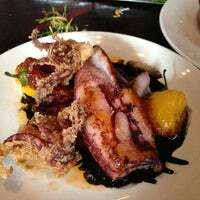 The charred octopus is great. This place can be very busy so make sure you call ahead and get a reservation. Razor clams made me a believer. A simple dish with incredible taste. The pork croqueta is a piece of heaven. 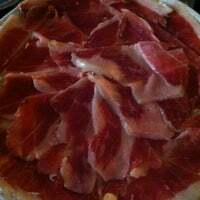 Their jamón ibérico is a great cut. Great spot to bring a date. Great food, great ambiance if you do not mind the loud sound volume. Potatoes, scallops with green curry (picture) are delicious. This place makes me believe unicorns and Santa Claus exist. Wow. Charcuterie, seared duck breast and pork meatballs made the stars align. This is placed in the top 1% of meals I've had in NYC. Catalan Spanish food at its finest in such a cozy warm venue. 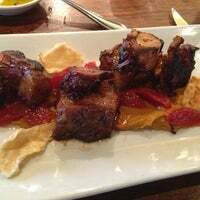 Goat cheese pumpkin croquetas and tamarindo pork belly dishes are not to be missed. One Michelin star well deserved. 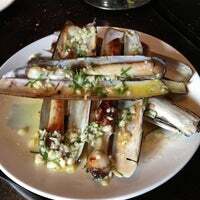 Razor Clams is drenched in olive oil & garlic. Pulpo had slight bitter & citrusy flavors from the fennel and grapefruit. Pork Croquetas were a bit dry for my liking & Pan con Tomate is boring. 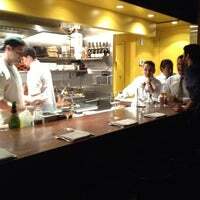 This has been my favorite restaurant in NYC for 12 years and counting. Have never disappointed. So consistently delicious. That seared foie with cinco cebollas oh man oh man. sit at the bar and watch the tapas masters earn their keep. my faves are the snapper crudo, soft shell crab bocadillo and pork belly with uni. also - great foursquare Special for Newbies. It's a bit pricy 100$ for two people, but they have a bar right next to it 'bar jamon' that is much more affordable but is really small. 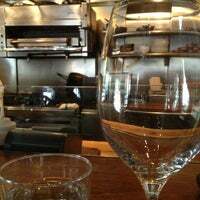 The place is small and cozy, try the calamari and croquetas! 5 years since the last time here. Different times and different company. Happy with the girls here... And the razor clams. Be sure to make reservations at this cozy Michelin-starred tapas restaurant. Order the razor clams a la plancha, skirt steak with romesco, and quail. If you want tapas, this is it. Our waiter recommended the duck egg with mojama, and it was a spot on. Also, sit at the bar to experience Spanish food cooked à la plancha (on the grill). Creative Spanish tapas.., cozy restaurant in Aster place. Food is a little salty side but very tasty. Come before 6pm if you want to attempt walk-in dining. 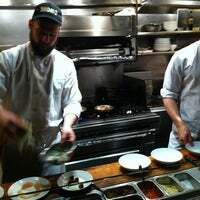 Bar seats are the best because you get to watch the chefs prepare the delicious dishes! Duck egg, razor clams, pigs ears, rabbit... literally just ate a Dr. Suess book and it was magnificent. Add lorax to the menu and fuggadaboutit. This place is off the freaking hook. 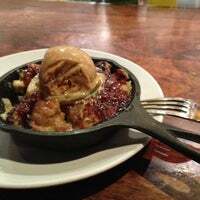 Delicious tapas, desserts (of course try the traditional crema catalana!) and world class wine (cava!). I love both sides. Casa Mono for the razor clams and beets. Bar Jamon for wine and cheese. When you go for the cheese get a sheep, cow and goat. Love life. It has been a while since I have been but the tapas are phenomenal. It doesn't hurt that it has a Michelin Star either, seven years in a row. Really tasted tapas, very originals combinations of food and amazing wines! Love it!! Everything is above average. Razor clamsa la plancha and squid with harissa and squid ink are standouts. Wish it were a bigger restaurant! Yummy. Wines are from Spain, ie prepare to enjoy with the meat then be ready for the tipping point into headache and the hangover later. Substantial tapas and medium-sized entrées, done mostly “a la plancha” with unmistakably Catalan flavors; get the duck egg with mojama. Fun and trendy spot for some Spanish tapas! 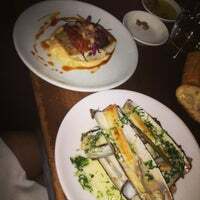 Must try's are the bone marrow, burrata, oxtail stuffed red peppers and carpaccio. Bone marrow, pork belly, and pork croquettes were delicious! Servers seemed grumpy, but it was Christmas Eve, so they might just not have been happy to be working. Moroccan lamb was ok. Excellent desserts. Great wine and great food. You can't go wrong! this place is amazing. I was treated so well by victor. great wine knowledge and welcoming personality. definitely come here. the price is worth the experience. 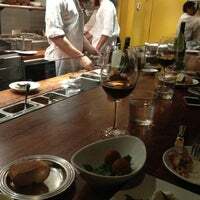 Casa Mono, Mario Batali's cozy tapas joint near Union Square, is serving up small plate classics like, Pork Croquetas, Spanish Mackerel, and Razor Clams A La Plancha. Everything was beautiful, cooked to perfection and absolutely delicious. Unique and delightful, Casa Mono is an absolute gem. Authentic. Great food ! Razor clams, tomato bread, scallops, grilled squid, quail. "Everything was cooked to perfection! A few of my faves were the brussels sprouts, pulled pork empanadas and the hanger steak." "GreAt Jamon and mushroom flat bread. Pitcher of sangria was very good but squid and pulpo were excellent. 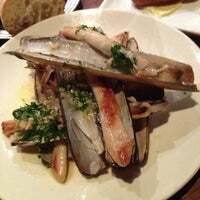 Coming back fir sardines"
"Top two: croquettes and the patatas bravas. 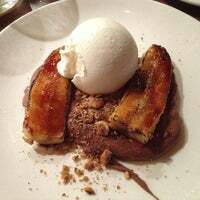 Can't wait to try the chorizo con chocolate next time!" "Whiskey Business is excellent. Perfectly balanced drink." "Great for a date. Excellent wines - a cheesemonger's heaven. And a great charcuterie selection. Knowledgable staff." "The eggs Benedict and French toast are a delight here. Also, $11.95 for a brunch entrée plus coffee or tea is a great deal!"